With Memorial Day coming up, you’ll probably want to spend more time outdoors, especially if you’re hunting for firewood in the woods behind your house. Even so, make sure you are mindful of these bonfire safety tips for the holiday weekend and all summer long. 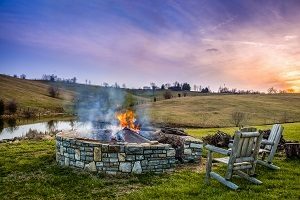 Building a bonfire to stay warm on chilly spring nights is a fun activity to spend some quality time with friends and family. With Memorial Day coming up, you’ll probably want to spend more time outdoors, especially if you’re hunting for firewood in the woods behind your house. Even so, make sure you are mindful of these bonfire safety tips for the holiday weekend and all summer long. First of all, bonfire safety fires many of the same principles of fire safety in general. Don’t play with fire, and make sure that your bonfire will be contained in a bowl or fire pit. Push furniture back, so it’s not too close, and make sure there aren’t stray leaves, papers, or anything else too close to the fire that could catch a spark. Don’t use too much fuel for the fire, and make sure the lid can easily be clamped down to help put the bonfire out if it gets out of control. Lastly, make sure you check on wind conditions. If the wind is too high, then it’s probably not a good idea to get the bonfire ready. Now that the fire is lit, our next set of bonfire safety tips has to do with common sense. For example, don’t leave the fire completely unattended – make sure someone is looking after it if you need to run inside for more snacks or drinks. Have a first aid kit on hand in case someone suffers a grease burn by accident. Fire extinguishers are also a necessity, so verify that the fire extinguisher you have is fully charged and operational in case you should need to use it. After all, it’s better to have it and not need it than the other way around. Finally, don’t throw any trash into the fire – although it’s tempting to do so, the black smoke that is released can be extremely toxic. Once you’re finished with the bonfire, it’s time to put it out. Our last set of bonfire safety tips relate to properly extinguishing a fire in your backyard. You might think that the fire might gutter down to ashes and embers, but even if it does, it can always flare up again. Due to this, you should completely extinguish the fire before going inside. Exercise extra caution while disposing of charred firewood, as it can still be incredibly hot. This entry was posted on Friday, May 25th, 2018 at 1:44 pm. Both comments and pings are currently closed.